Spunky Allison McClare is determined to be a fearless, independent woman, resorting to a mammoth hat pin for protection on her way to and from the school where she teaches. But when she takes a notion to explore the wild Barbary Coast she quickly discovers she is no match for rum-soaked brute strength. Detective Nick Barone would rather do almost anything than teach this petite socialite jiu-jitsu, but it seems he has little choice in the matter. Sparks fly every time the two meet until a grudging friendship develops into something deeper. But when Nick suddenly leaves town, Allison realizes he’s a fraud just like all the rest of the men she’s cared for. 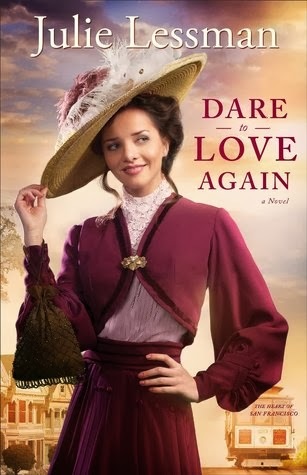 Does she dare love again? Again I find myself reviewing the second book in a series when I haven't read the first! Luckily for me, this book didn't need for me to have read anything else. Like so many other books lately, I loved this one too. (I guess I've gotten lucky and not had a lemon in a while!) Allison certainly is spunky and there's a twist to Nick's story that I certainly didn't see coming. Historical fiction is another favorite area and this book didn't let me down in the slightest. I received a copy of this book for the purpose of this review. All thoughts, comments and opinions are totally my own.